It’s time for milk, fig newtons and beautiful sunsets as Season 5 (!) gets underway with this two-parter that aired on 27 September and 4 October, 1984. 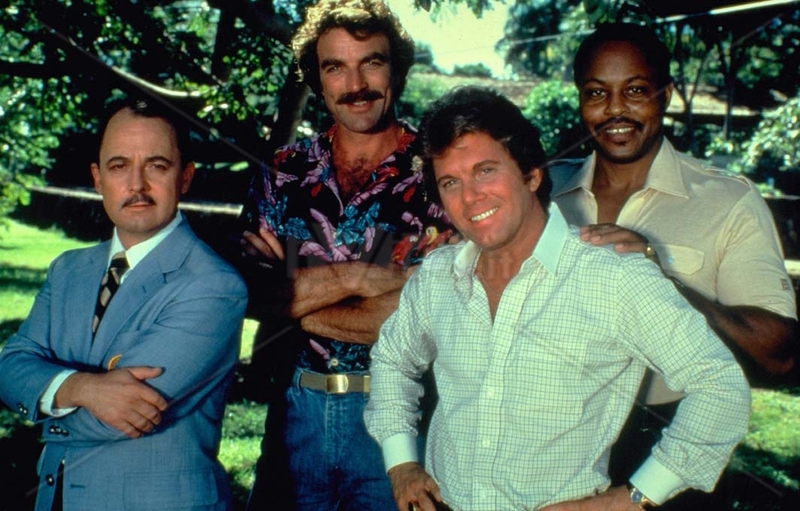 The season opener was penned by Bellisario himself, and sees both Thomas (Tom Selleck) and Higgins (John Hillerman) dealing with love in their own way. It also uses the New American Orchestra version of the Blade Runner end credits to open the episode. Higgins after much reflection, and correspondence, has proposed to the Lady Ashley (Carolyn Seymour), who has accepted. This, of course, causes nothing but heartache for Higgins’ dear friend Agatha (Gillian Dobb), who thought Higgins meant her when he was talking about getting married. From there, it explores their relationship rather nicely, while Higgins realizes that if he is to marry Lady Ashley, she wants him to give up his lordship, he is only a baron, she’s a duchess, and she refuses the idea of losing that title in the peerage. Thomas, meanwhile, has been hired by Diane Dupres (Sharon Stone) to protect her while she’s on the island. She fears she’s being followed, and she thinks that someone is following her. Thomas is rather taken with her from the beginning, something Rick (Larry Manetti) realizes right away, but also knows that his friend won’t listen to his warnings about the seemingly naïve, chaste, and attractive woman. Thomas is so sympatico with Diane, that while Higgins is cheerfully buying, he, Rick and T.C. (Roger E. Mosley) to celebrate his upcoming nuptials, senses that she’s in trouble, and ends up being on the receiving end of a vicious dog attack. And as a nice aside, we get a great moment with Doc Ibold (Glenn Canon) who may be a skilled doctor, but his bedside manner is a little questionable. The show is filled with some great moments for almost all the characters, Higgins and Agatha have a nice moment when he breaks the news of who he is actually marrying to her, Thomas realizes he’s falling in love with Diane, Deborah Pratt shows up as Gloria to spend some time with T.C., and her fellow flight attendant, played by June Chadwick, reveals that she and Rick have been seeing each other for about 6 months. Trouble rears its head, however, when Deirdre shows up on the island, sleeping with Thomas under the guise of being Diane, and reveals to the investigator that Diane has spent time in mental institutions and has attempted both suicide and homicide. What a fantastic episode. Haunting.